Ultra Pro Baseball holder with gold base. 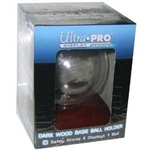 This holder is great for long term storage, protection, and display of autographed baseballs. A must have item for any baseball memorabilia collector. Safely stores and displays one baseball. The dark wood base is genuine wood. Safely stores and displays one baseball and card. The base is genuine wood. 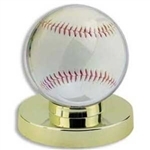 Beautifully designed baseball display case with mirrored glass on the bottom and back, to get the full exposure of your treasured baseball. This case is UV protected and is supported by cherry wood molding. This also includes a clear holder for the baseball. Inside dimensions are 4" x 4" x 4". Beautifully designed baseball display case for two baseballs. It is made with high quality, double strength glass and mirrors and accented with furniture grade molding. Beautifully designed Triple Baseball Display Case displays three baseballs. This case is UV protected and is supported by cherry wood molding. This case also includes three clear holders for the baseballs. Inside dimensions are 10" x 4" x 4". The BCW Deluxe Acrylic Baseball Helmet Display Case features a black base with gold risers, clear cover, and a mirrored back. BCW acrylic displays contain UV absorbers to help protect your memorabilia from ultraviolet yellowing. Use this sports memorabilia holder to protect, store and display your collectible helmets from the MLB. The baseball bat display case comes with a mirror on the bottom and the back of this case. This case is UV protected and supported by cherry wood molding. Made with a non acidic adhesive to avoid any signature fading. The inside dimensions are 36" x 4" x 4". Includes 2 small clear holders for your baseball bat. Baseball bat is not included. The BCW Deluxe Acrylic Baseball Bat Display Case features a black base with gold risers, clear cover, mirrored back, and hidden pre-drilled holes in the back of the display for easy wall mounting. BCW acrylic displays contain UV absorbers to help protect your memorabilia from ultraviolet yellowing. Use this sports memorabilia holder to protect, store and display your collectible baseball bats.